Anaheim, California played host to WonderCon this past Easter weekend. 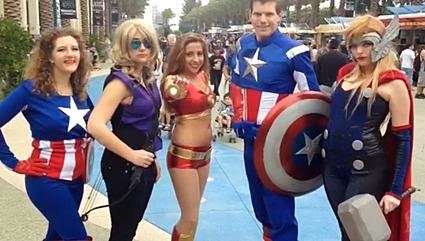 For those not in the know, WonderCon is a major popular arts conventions in California, promoting comic books, science fiction, gaming, animation, TV, film and everything in between. If you’re a pop culture fan, this is the place to be. International: San Diego, which is held every summer in San Diego. However, even though it’s (slightly) more intimate than Comic-Con, there are still TONS of fans showing up in costume. They’re known as cosplayers, and they range from “costume in a bag” folks who just want to show up and have fun, to serious partipants who spend months and thousands of dollars perfecting the wardrobe, makeup and overall look. But the one thing they all have in common is that they’re here for the fun of it. Last year’s WonderCon saw a bunch of DC comics and Batman-themed costumes, which made sense considering the film was on everyone’s lips. This year, it was all about Marvel’s X-Men, Avengers and Captain America — you know, because they have some popular movies out this year as well. Of course, there were plenty of tributes to video games, Japanese anime, Disney and more. Once again, we sent our photographer Mari Provencher to the convention to snap some pics, and we’ve posted the best cosplay costumes she found this weekend. Check them out, as well as the news report from the LA Times above, and let us know which ones you love!